Music plays such an important role in spirituality. Music that is made of vibration. We can trace back life or creation also to vibration - to sound - the OM (Aum). What provokes me to write this article is the recent videos I saw on westerners creating and singing bhajans or chanting them so beautifully. Also a video that was posted by Preet which showed a child looking at the picture of Yogananda Paramahamsa and singing. It is such a beautiful connection. For me, music has always played a great role in "connecting". I say this with experience in producing music, creating tunes, singing, playing instruments, etc. I never knew that it could be so connecting because I always had this craving since childhood for music. I always played or sung for music groups just for the passion I had for music. It was only after I came in touch with babaji that I learnt many many things including the music connection. I also realized a very important thing. All my life, I have seen the music industry giving so much of value to singers, performers and musicians who can give quality. This quality was limited to voice perfection and perfection if performance and any music that was produced. More of all, every bit of music that is made and is sung or performed is precisely done keeping in mind the taste of the audience. The mood of the audience changes and the music creation and rendering changes, always adapting to the changing tastes of the audience. I observed this everywhere, picking and pointing out the errors or flaws that singers made or things that didn't suit in the instruments that were played. I developed this habit in order to get things to perfection. I watched few bhakths or sadhaks in bhakthi marg (devotion) on TV singing offbeat and tears flowing down their cheeks. I would just wonder why did they have to sing if they did not know how to sing. Then as I came in touch with ShivYog, I saw few episodes on TV where babaji sang and he sang not in perfection. I noticed the glitches; I ignored it since he was a guru. Same thing, I carried with me to the shivirs. There what I saw and experienced changed my entire perception of music. babaji was still singing, like in TV, but this time there were no flaws! He must have missed the raaga or taal but this time the organs for singing and hearing were different. His organ for singing was his heart and my organ of hearing was my heart... and it indeed was such beautiful music, such a beautiful song! This music and song excels all ratings of real music! Then I realized that what we look for perfection and label as perfection in the 3D world is not perfection but our perception! Perfection is what I now listen and feel and hear and sing. babaji taught me new music. A person who has no formal training in music still excelling every bit of music score and with so much of power and awe. It is then that I realized how people singing and dancing in the vicinity gurus do it without any watch on themselves on the quality of their singing or dancing. The language of music is universal and can be felt throughout the world. Here is a video of a western group that I accidentally (of course, there are no accidents or coincidences) came across on youtube. Irrespective of the language and pronunciation watch the energy levels rises with the song Kali Durge Namo Namah..
Irrespective of the language and pronunciation watch the energy levels rises with the song Sambo Sadashiv.. When I look around in the Shivir, I know that many are withholding their spirit that wants to leap out in the sankirtan. I sure am not the one that dances or sings even now.. ha.. ha, but it is a lot better than what it was earlier. I wanted to sing and dance but felt the barriers of "decency" of man-made society. How we feel embarrassed of being ridiculed or mocked at and when we look at babaji , there are thousands of eyes glued on him, yet there is not a trace of being conscious in any way of the audience. And what all babaji does while singing; he tosses, swings his arms, raises his eyebrows, makes faces, and does everything like a small child does, being totally immersed in the joy of singing and immersed in his bliss. That is why just looking at him during those moments one feels elated. This is when I realized the real meaning of sankirtan. 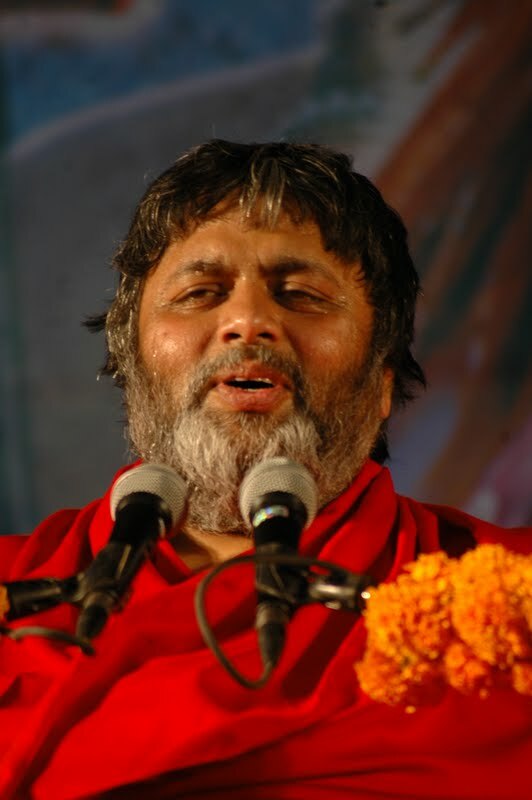 Babaji always talks about the three S. Sadhana, Seva, Sankirtan being the essential part of ShivYog. Many feel Sankirtan is not important. This is when one still has the feeling that to sing one must know singing or to dance one must know dancing. Our master does not know either but yet he is so perfect in it! Sankirtan starts coming in when one releases the body consciousness or the "I"ness starts reducing. I am not pointing at you but at myself since I still have this "I"ness. Sankirtan is such a simple and entertaining method of letting go. This can be tried at home. Shut yourself in a room and play out the music and leave yourself loose. There will be a difference with the music on the dance floor (hip-hop, rock, etc) which you will enjoy for a while but it is exhausting after a while, but when one releases oneself through devotional music one will notice that it is not exhausting and one will feel more energetic after the let loose activity. Same happens in shivirs. If you notice, before doing sadhanas babaji builds up the energy level of the hall either through chanting or sankirtans and then begins with the sadhana. It is simply awesome to notice the energy vibrations before and after the sankirtan. So, let's let go of all the inhibitions and release everything with babaji's sankirtans. I made a small video mix of babaji's expressions and love in sankirtans. Have a watch. To download the above video click here. To listen, watch and download more of such creations from this blog click here. Keeping singing & keep writing...!